I decided to end our trip in the City of Lights, a last hurrah for Holiday shopathon, sightseeing and gluttonous indulgence before heading home. The high speed TGV train ride to Paris from Chalon-sur-Saône, where we disembarked, was a scant 3.5 hrs. Having stayed in the Left Bank and Marais districts before, I opted for a hotel by the Eiffel Tower. This would put us within striking distance of the yummy goodness of Les Gourmandises d’Eiffel, which has the best pain au chocolats and sweet croissants in Paris! 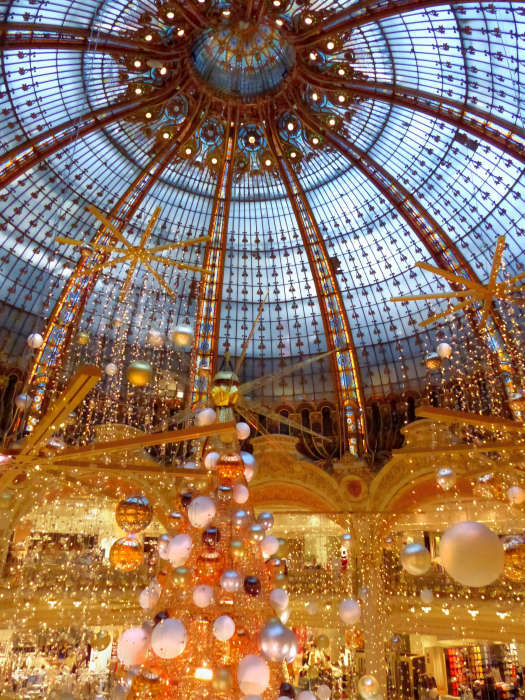 Atrium of Galeries Lafayette Boulevard Haussmann all decked out for the Holidays. Designed by Jacques Grüber in Neo-byzantine style, the iconic stained glass dome of Galeries Lafayette Haussmann makes a masterful statement. Strands of lights and baubles dripping off the dome added a festive vibe. Display in one of the children’s departments. 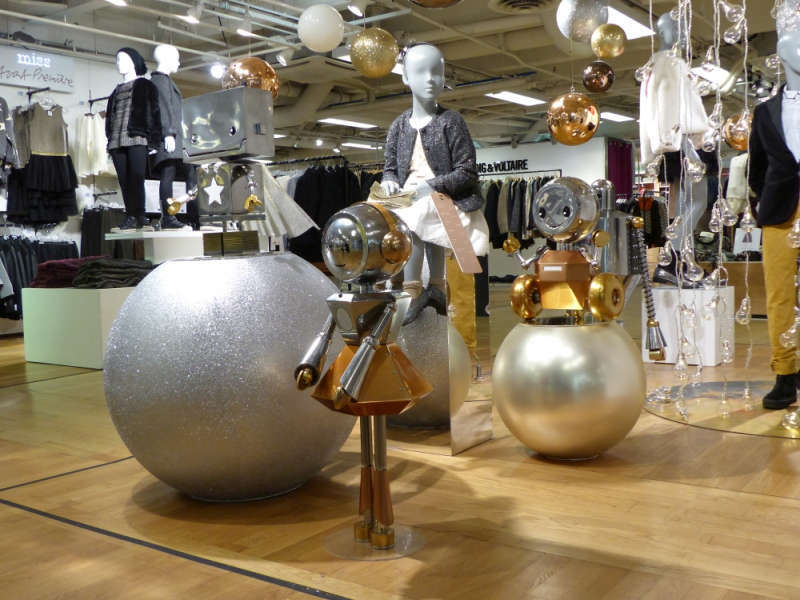 A sci-fi theme with cute robot-like mannequins (seemed like they were all girls) was running through the season’s displays. 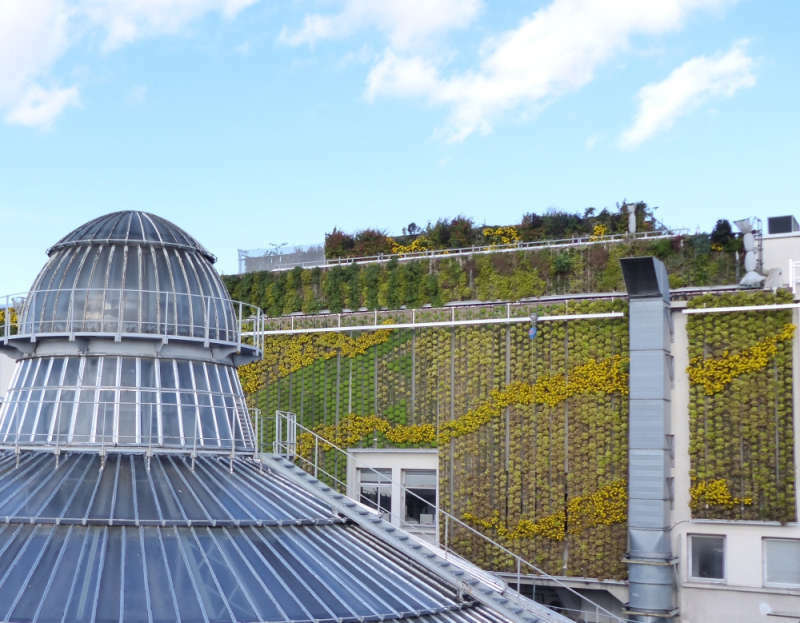 Rooftop farm at Galeries Lafayette Haussmann. It may not look like much, but this fruitful partnership between the department store and an organic urban farming startup is netting 6 tons of tomatoes and 18,000 bottles of craft beer brewed from the garden’s crop of hops. Façade of Printemps flagship store. 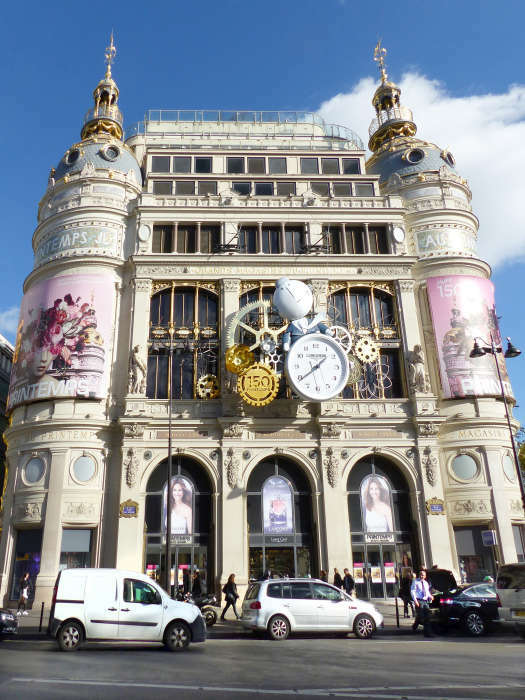 Printemps Haussmann pioneered animated Christmas window displays and is one of the biggest department stores in Paris. Dating back to the 1800’s, its distinctive façade is classified as a historical monument. Alison our hostess applying the finishing touches to her delectable salmon crème brûlée. I was amazed that Alison made most of this scrumptious spread that day. 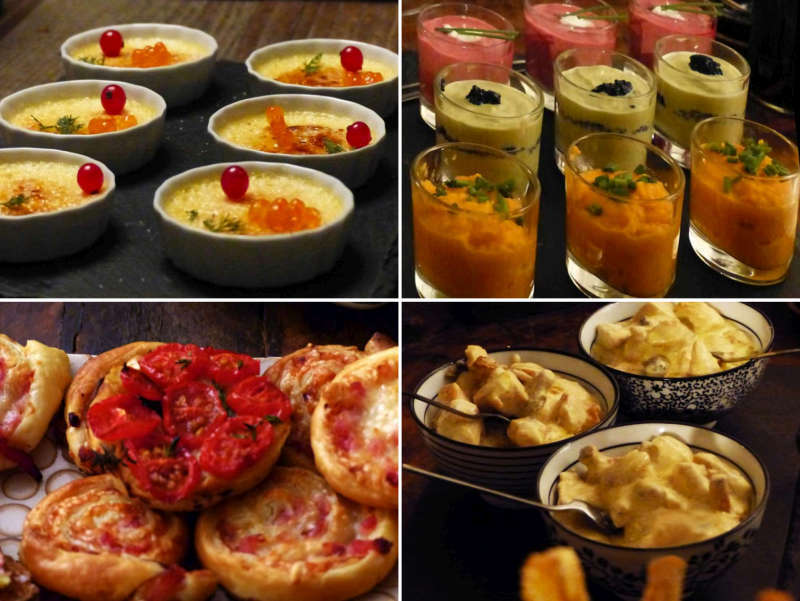 The feast kicked off with a colorful trio of carrot, asparagus & beet soups, then came salmon crème brûlée, chicken with truffle scented potatoes and bacon & tomato confit palmiers. The house made foie gras, which has to be made overnight, is to die for!! 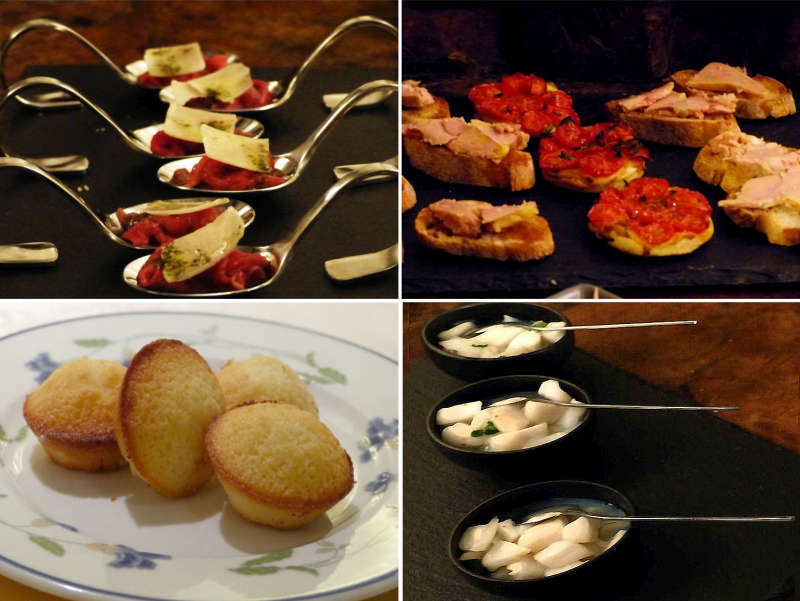 They were followed by foie gras alternating with tomato confit on toasted baguette, beef carpaccio with Parmesan cheese, scallop ceviche, and last but not least, financiers as dessert! The famous cabaret landmark Moulin Rouge. 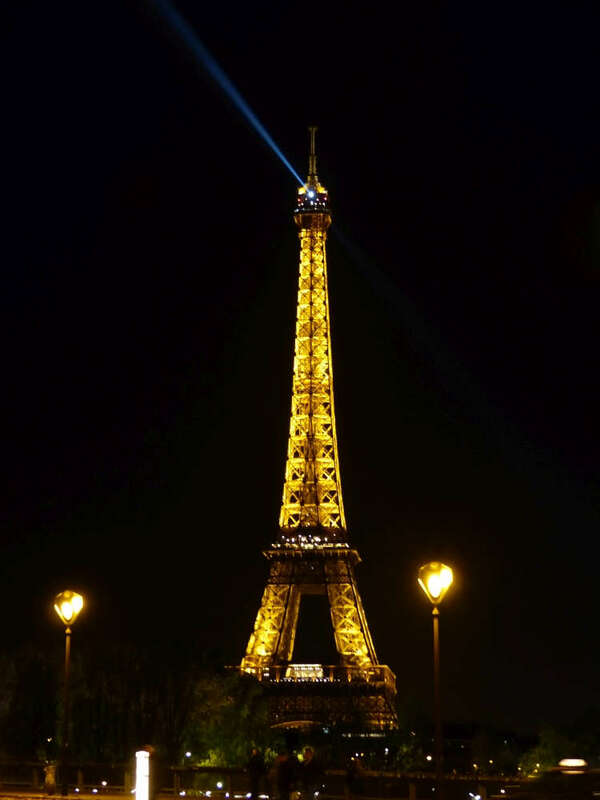 On my last visit to Paris, I had booked a Gastronomic Tour around the Eiffel Tower through Paris Greeters, a non-profit whose members generously volunteer to share their city with visitors. Unfortunately, a cancelled flight upended our plans. This time, I decide to check out the Montmartre neighborhood where Vincent Van Gogh and Henri de Toulouse-Lautrec hung out. 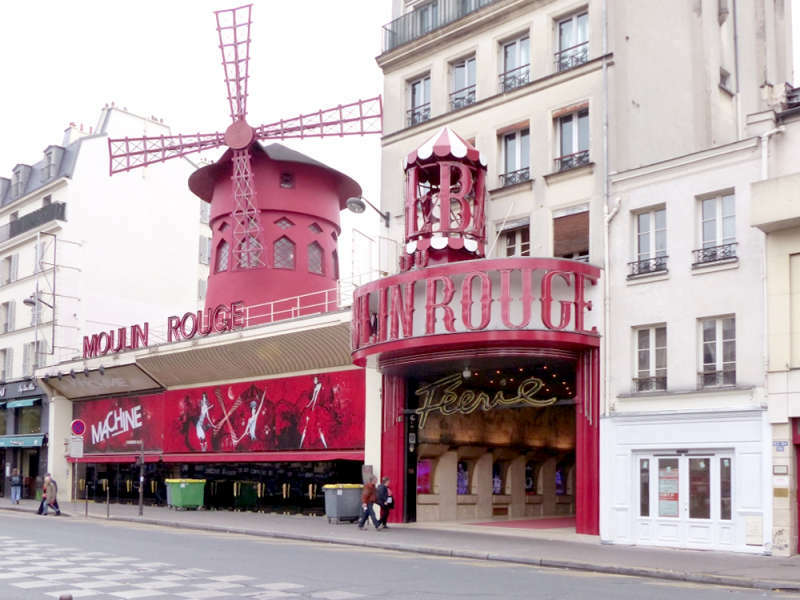 We met up with our guide Peter and soon got our first glimpse of the fabled Moulin Rouge, the cabaret that embodies Montmartre’s Bohemian spirit and has entertained commoners and royals alike for over 150 years. 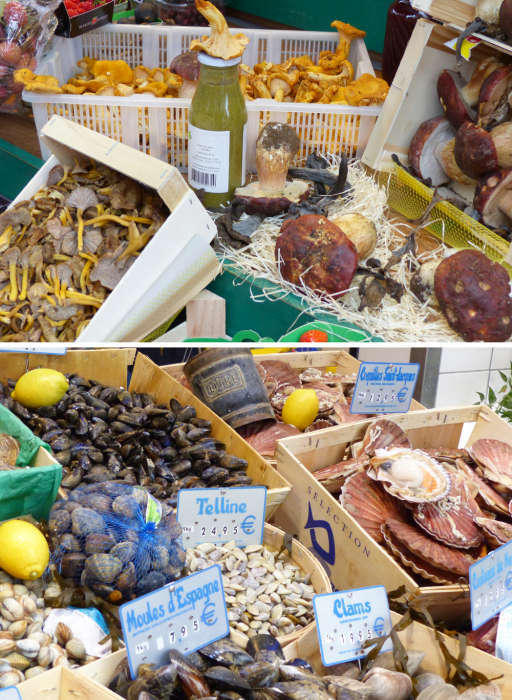 Local shops overflowing with the bounty from land and sea. Peter also took us to some of his favorite food shops. It’s fall and choc full of mushrooms (my favorite produce) of all stripes! Love how fresh scallops are often sold in the shell throughout France, while my ‘fresh scallops’ back home come out of a giant 3 lb. can. 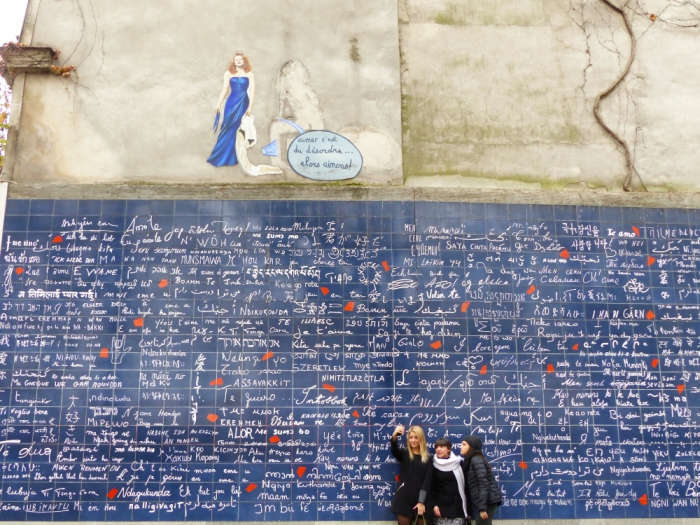 Le mur des je t’aime (Wall of love). Created by a muralist and a calligrapher in 2000, this selfie magnet is made of 612 tiles of enameled lava. The phrase ‘I love you’ is written 311 times in 250 languages, including Navajo, Inuit and Esperanto! 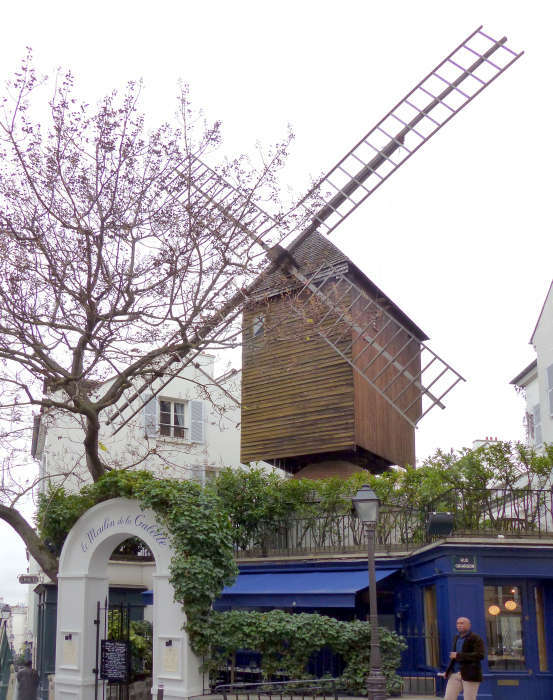 Moulin de la Galette topped by a historic windmill from 1717. Moulin Blute-fin and Moulin Radet were the last two surviving windmills in Montmartre. Both were owned by the Debray family, who were millers and bakers. Moulin Blute-fin, where the Debrays sold their very popular galettes and wine, was eventually renamed Moulin de la Galette. A regular haunt of Renoir, Van Gogh, Lautrec and Picasso, the eatery was depicted in Van Gogh’s Le Moulin de la Galette and Renoir’s Bal du moulin de la Galette. A sculpture that immortalized the short story Le Passe-Muraille (Walker-Through-Walls) by Marcel Aymé. 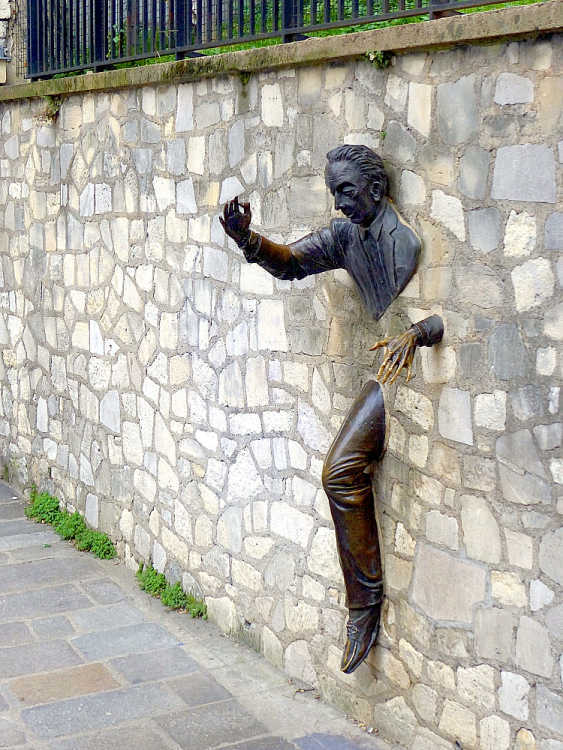 Le Passe-Muraille was about a man who discovered, and then subsequently abused, his unusual power to walk through walls – until one day he lost that ability and got stuck in the wall. The 1989 statue by actor Jean Marais was created on the wall in front of Marcel Aymé’s house as a tribute to the novelist. Basilique du Sacré-Cœur (Basilica of the Sacred Heart). 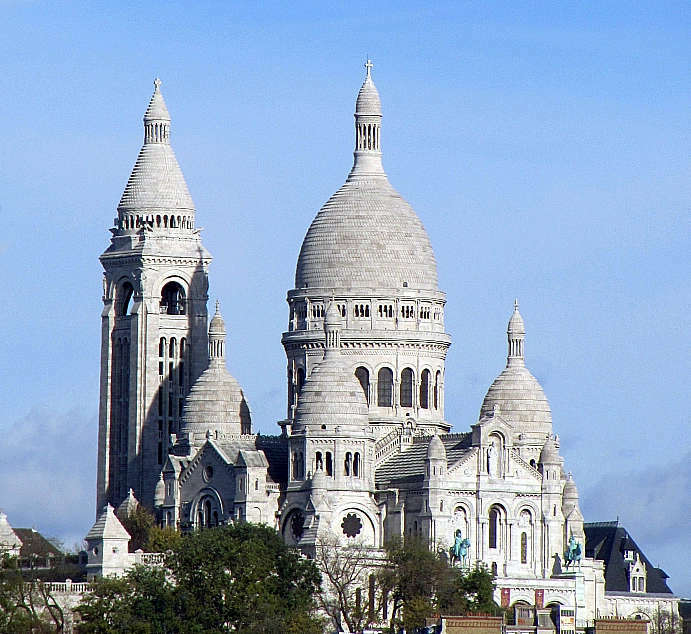 Of course we can’t tour Montmartre without visiting the Basilica of the Sacred Heart. The second most visited monument in Paris, it is located at the summit of Montmartre, the highest point in Paris. The Romanesque-Byzantine architecture, more akin to St. Mark’s Cathedral of Venice, was a reaction to the exuberant neo-Baroque ornamentations at the Palais Garnier. 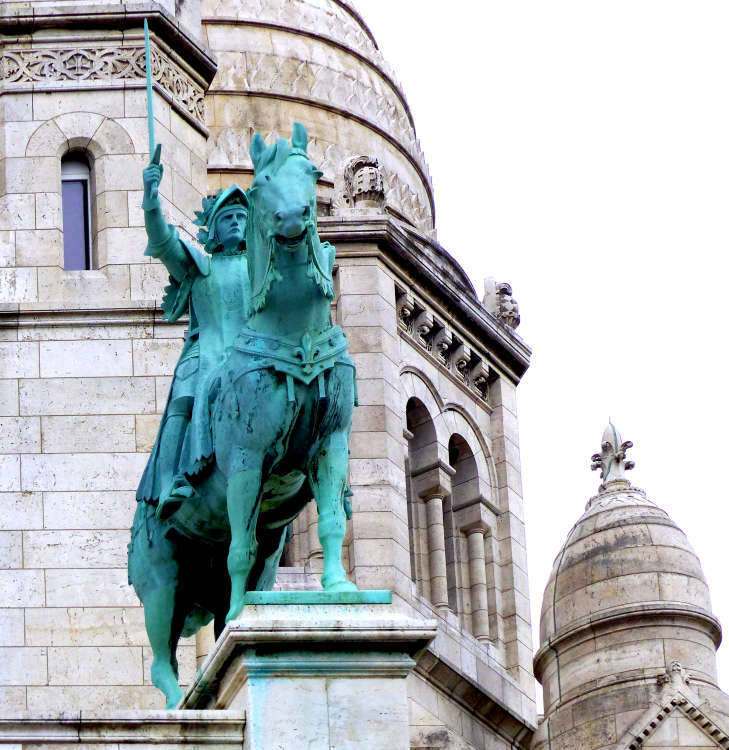 Equestrian statue of Joan of Arc by sculptor Hippolyte-Jules Lefèbvre stood proudly in the front of the basilica. The basilica was built as France tried to stoke nationalist pride after much internal turmoil and a recent military defeat in the Franco-Prussian War. Joan of Arc, as the country’s national saint, defender of the country and its faith, fitted perfectly into the narrative. 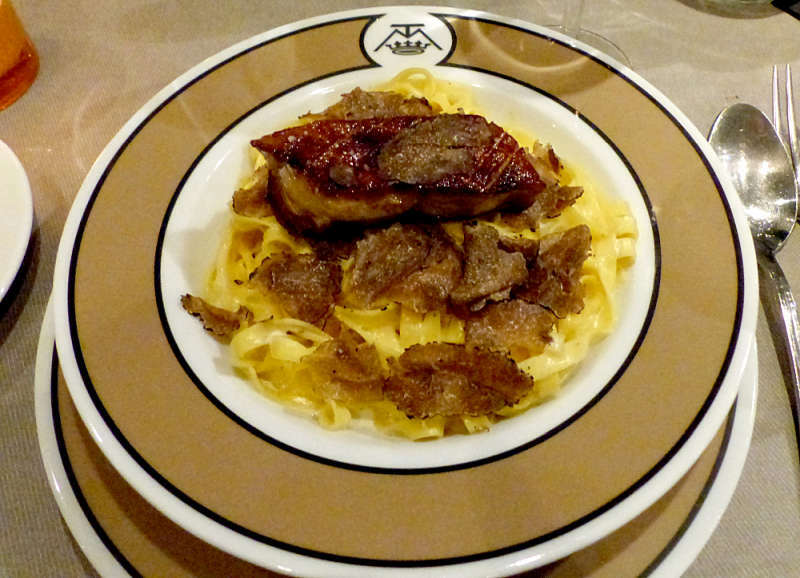 Taglierini with foie gras and truffle! For our final dinner, we booked a table at Maison de la Truffe, aka The Truffle Palace, at Rue Marbeuf. It offered truffle and foie gras – all the good things in life – in a single dish. Who can resist that?? 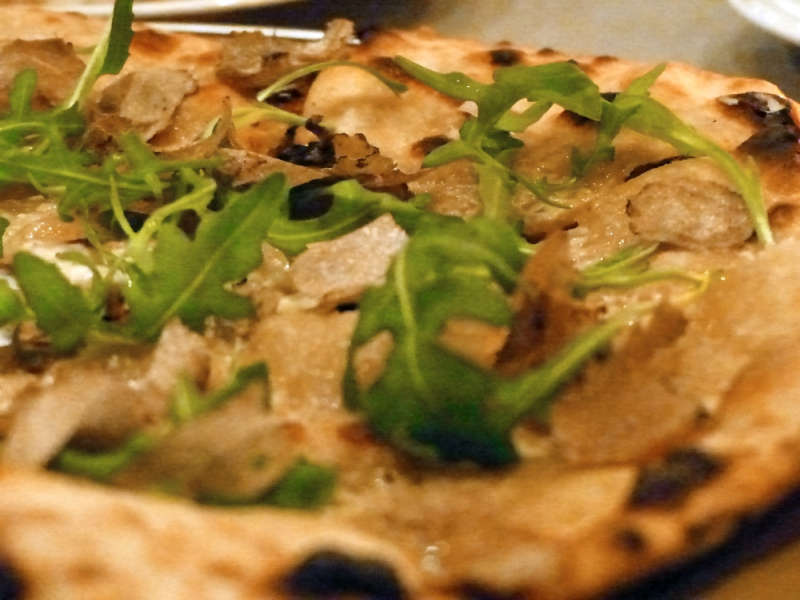 Seasonal truffle with mozzarella and rocket salad pizza. Among the other dishes we tried was another of the restaurant’s classics, a pizza simply named ‘The Famous’. The bubbling cheese was a perfect foil for the shaved truffle and baby arugula atop the blistered cracker crust. We were so full that we decided to take half the pizza back. In fact, on our flight home the next day, we had a ‘leftovers feast’ of foie gras and truffle pizza – making it the best Cattle Class airline meal we’ve ever had! Tour Eiffel in its full glory at night. This entry was posted in Architecture, Food, Travel and tagged Basilica of the Sacred Heart, Eiffel Tower, Galeries Lafayette, Le mur des je t'aime, Montmartre, Moulin de la Galette, Moulin Rouge, Paris by Marie Chan. Bookmark the permalink.